Vivaldi Partners defined social currency as the extent to which people share the brand or information about the brand as part of their everyday social lives at work or at home. I’m not suggesting that influencer outreach is useless or should be abandoned. But, it’s not magic beans. It needs to be looked at for what it actually is – the top of the funnel component of a larger program to generate awareness AND behavior using social media and content marketing. 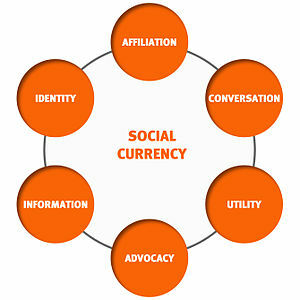 So take all the aspects of social currency run them through how marketers use them, snap on Jay’s components and basically what you’re left with is a bunch of marketers floundering with the notion of what social currency is. They’re thinking that presence equates to value divided by attention will equal ROI. Social currency may not be counterfeit but we need to put the proper value on the currency before it’s too late. When Does Online Privacy Not Matter Anymore? Are we becoming a nation or a society that is devaluing certain aspects of online privacy? As more and more of our lives become intertwined with online networks we become desensitized as to what is private and what is not. Take for example the liberties or assumptions that Live-Hive would like with your personal information. What is private? What is personal? What is sharable? Depending on what your beliefs are, the bar for leveraging the usage of a service against what is indeed your personal IP and private data has either been lowered or raised. Some of you won’t care, others might walk away and still others will click yes like they do a EULA and be done with it. None of us care until it directly affects and impacts us. That’s sad.